Welcome to the latest issue of INSIDE ATLAS.ti. More and more researchers are discovering the great new tools and features of ATLAS.ti 7 (available since last summer) and are switching over from older program versions or other products. Version 7's powerful multimedia engine, the intuitive margin-area for all data types, and the convenient way of simultaneous working on multiple documents were designed to meet a long-existing need of researchers, and we are happy to hear that ATLAS.ti 7 and its new capabilities already play a vital role in a great many major research projects and contribute significantly to their success. Yes, as you know, development at ATLAS.ti never stands still, and so our team is constantly hard at work to further improve and expand the possibilities--always guided by the user community's immediate needs. A case in point is the revamped transcript import engine: Users expressed an interest in being able to import projects directly from a popular transcription program, and we were glad to oblige by adding that capability. The “Best Practice” article in this issue explains how to work efficiently with imported transcripts from f4/f5 and Transana. Currently, ATLAS.ti supports the import of transcripts produced with f4 (Windows), f5 (Mac) and Transana. 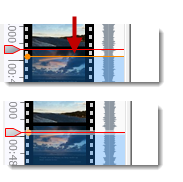 Time markers from the transcript are automatically converted to association anchors. The connected audio or video file is also imported. When preparing a transcript in f4_2012, it is possible to change the format for time stamps. However, for import in ATLAS.ti, the default format is needed: 00:00:00-0 (hours:minutes:seconds-milliseconds). When preparing a transcript in Transana, you need to save it as external file (File / Save Transcript as...). Before you do that you need to activate the time code values as shown below. Hide the time code indexes (red symbol). You can still import a document that shows indexes, but they will just be displayed as an additional symbol in addition to the red dots that mark the time stamps in ATLAS.ti and thus are more disturbing than helpful. To import a transcript, select the main menu item Documents / New / Import Transcript. A file browser opens. Browse to the location where the transcript is stored, select it and click on the open button. If the associated multimedia file is not automatically recognized, you will be asked to select it. The file browser opens again and you can select the multimedia file. Select whether to import the multimedia file in My Library or the Team Library. The transcript is added as an internal document. 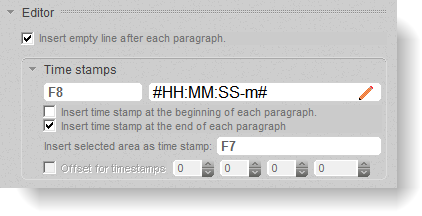 A new association is created in the Association Editor, the two documents are added to this association and the time code values are converted to anchors. By popular demand, we are now introducing the new Semester License, a convenient new license type for student users who need to use ATLAS.ti only for a limited time or for a particular project. Students can now select between the regular student license--good for entire duration of degree studies--and a new six-month semester license. Priced at only $51, the semester license is the most affordable way to obtain our professional QDA tool with a student budget. A semester license is limited only in regard to period of user. All functions--including collaborative tools, new multimedia engine, multi-document view--are fully available. A semester licenses allows use of the program in the context of the license holder's full-time degree studies for the duration of six months. Semester licenses can be extended by purchasing another semester license, or converted into a regular student license. All terms, conditions, and procedures of the regular student license apply. In my dissertation I discuss the public media discourse on the role of women in Nazi Germany after 1945. Thereby I was not interested in the “actual” role women have been playing in National Socialism. Rather, I wanted to examine the images of these women as they have been portrayed by the media. Where these images subject to change, and what kind of function did they serve in the discourse of commemoration? 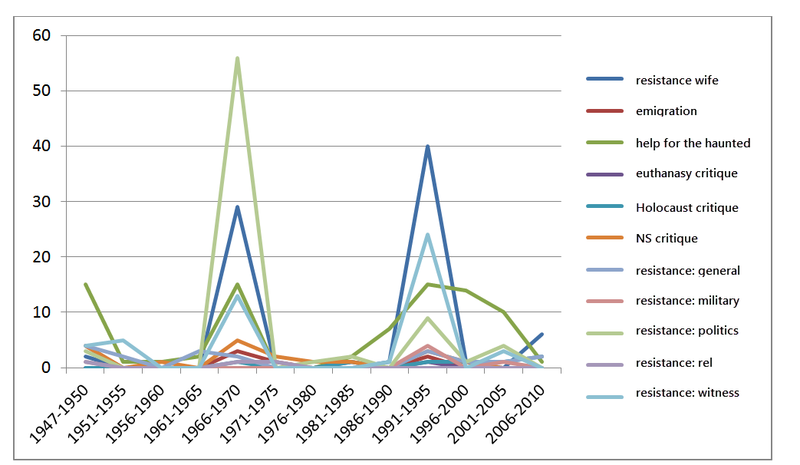 In total, I examined 484 articles published between 1947 and 2010 in the weekly news magazine, Der Spiegel. The data was analyzed with ATLAS.ti based on the NCT method of computer-assisted qualitative data analysis as described by Friese (2012). After adding the scanned articles in PDF format to my ATLAS.ti project (the HU), I grouped them by a number of characteristics. This was achieved by creating document families, e.g based on whether the article was an interview, a commentary, a book review or a report; based on the year of publication, or the magazine section like society, film, culture, media, sports, etc. Since the ATLAS.ti code list is sorted alphabetically, prefixes were used to structure the list. 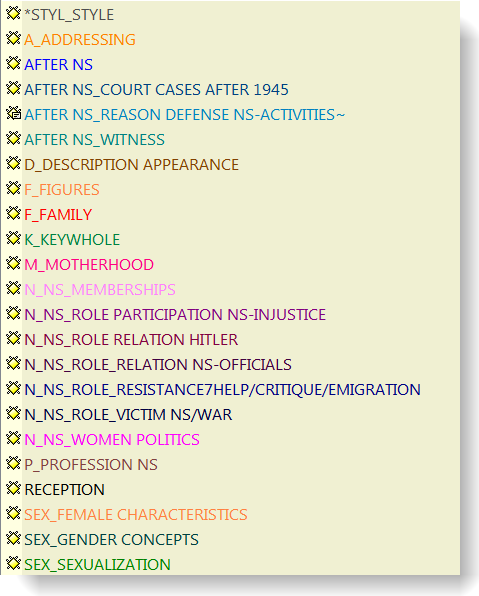 Main category names were written in capital letters to provide a better overview. While utilized during the process of developing the code list, all main category codes are empty in the finished code list, i.e. they do not contain any data segment. All content is coded with the sub codes of a main category code (see below). (1) What is the course of public discourse on the role of women in Nazi Germany as portrayed by the news magazine Der Spiegel, and how can the trend be interpreted? Taking a closer look at the data, it became obvious that the two peaks of the above shown progression of coverage were based on two articles: A report on the resistance of the "Red Orchestra" from 1968 (PD 341), and an article from 1994 on the wives of the men of the resistance of the 20th July (PD 502). I focused my further analysis on the two following aspects that were also coded in the data: "female characteristics" and "gender concepts". For this I used the A7 network function that allows for working with filters. This is a great addition to the existing analytical tools that was introduced with the new version. 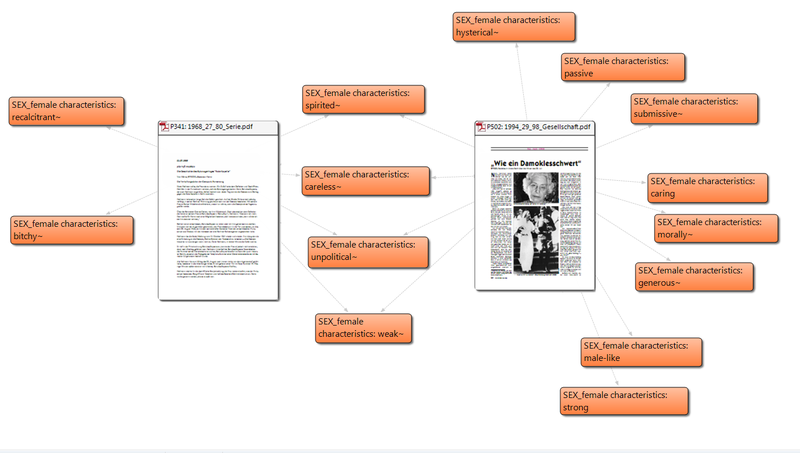 The resulting network view shows that the women of the "Red Orchestra resistance” are described differently (left and center) than women of the resistance of the 20 July (middle and right). While only the women of the "Red Orchestra" are presented as being bitchy, with a more pejorative character, the women of the resistance of the 20 July are portrayed much more positive. Classic "feminine" gender role-oriented properties like altruism are attributed to them, or even strength. Properties, which were found in both texts are less clearly related to classic femininity stereotypes and include both positive and negative connotations such as being careless and weak, but also being spirited. 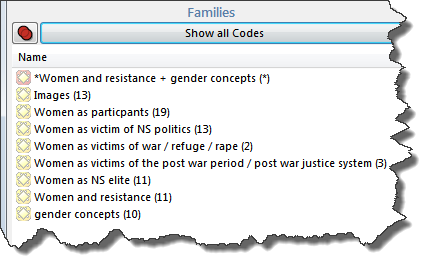 The network view shows that only the code "gender concepts: politics = male, home = female" is relevant to both texts. The "Red Orchestra" article otherwise manages without reference to further gender concepts. The next step in my analysis was to access the data behind the codes and to write up my interpretation. As the aim of this article was to show you some of the functions that I used in ATLAS.ti for my analysis, I will not go into more detail here. However, ff you are interested in my research and my findings, you are welcome to get in touch via email. Friese, Susanne (2012). Qualitative Data Analysis with ATLAS.ti. London: Sage. Many of the improvements in recent service packs resulted directly from user input. We thank you for your suggestions and requests! Since the release of v.7.0 in June, our development team has been busy further fine-tuning a number of aspects, some having to do with the interface, other completely “hidden under the hood.” In case you have not discovered some of these new goodies yet, below you'll find a brief description. Data file handling has been improved and large-sized projects can be loaded faster. 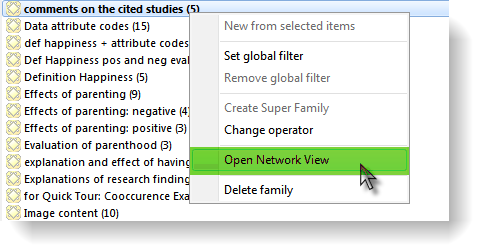 A new option has been added under the Documents / Data Source Menu that allows to copy documents between libraries. Open the Primary Document Manager and highlight the document(s) that you want to move. Right-click and select Data Source Management / Copy Selected Documents to... Depending on where the documents are currently stored, the menu offers the choice to either move them to My Library or the Team Library. In addition to supporting the import of f4/f5 transcripts, ATLAS.ti now also supports the import of transcripts prepared in Transana. This is described at greater length in the “Best Practice” article in this newsletter. Reference to video quotations changed from frame to time: Each video quotation has an ID consisting of the PD number and a chronological count of the sequence the quotation was created. This is followed by the name (the default is the document name, however each quotation can be renamed) and a reference indicating the start position and the total length of the quotation. 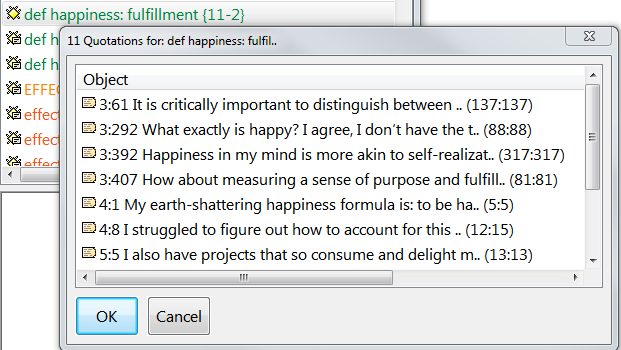 The quotation shown stems from PD 6, is the 5th quotation that was created, and was renamed to reflect its content. It starts at 56 seconds and 52 milliseconds and has a total length of 7 seconds and 46 milliseconds. If you move the playhead pointer over a quotation boundary or the other way around - the quotation boundary over the playhead pointer – the two snap. As shown below, this is indicated by a light shadow. There are two alternatives to mark start and end positions by using keyboard short-cuts. Move the playhead pointer to the desired start position. Select < or , to set the starting point. Move the playhead pointer to the desired end position. 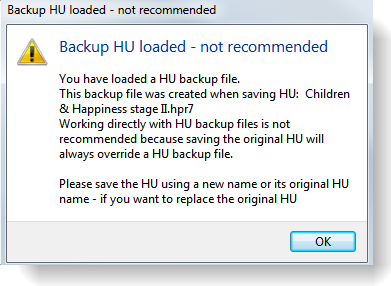 Select > or . to set the end point of a segment. Depending on your keyboard one of the two option ( <> or ,. ) is more convenient to use. Improved display of relations: Lines linking two nodes are now positioned closer to the node boxes in a network view. Earlier, if you positioned your nodes to close to each other, the relations could no longer be seen. Increased quotation picker size: When for instance double-clicking on a code in the Code Manager, the quotation pick list was sometimes quite small. This was related to screen-size and resolution. 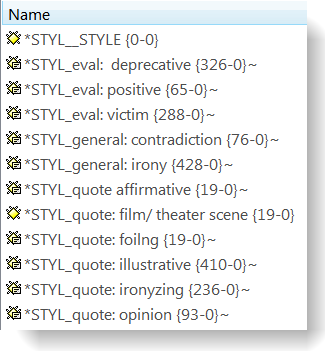 Now the full length of the default quotation reference is shown, also on smaller screens. Using cloud storage services like Dropbox to store your project data, especially in a team work situation, seems like a convenient solution at first glance. However, there are certain peculiarities of such services of which many users are not aware and which, if not considered properly, can lead to damage to your projects to the point of rendering them unusable. While Dropbox and similar services offer many advantages, it really depends on exactly how you use them so you can reap benefits from their use. Other ways can be downright detrimental to your work. If you mark a segment in the primary document, ATLAS,.ti “remembers” the exact location of that segment in your document from the last time you saved your project. If the document is later changed without “informing” ATLAS.ti about it, references will no longer be accurate and your segments will be off, your coding will misaligned, and hence your analysis would be flawed. Thus, if ATLAS.ti finds a document with misaligned segments, it will no longer load such a document in order to avoid further damage to your project. You can manually correct such misalignments at this point manually, but this is not a desirable thing to have to do and, of course, also frequently a very time-consuming business to boot. For ATLAS.ti to reference your documents and their content correctly (i.e., for your data to be usable), the program has to rely on the absolute integrity of these documents. This does not mean that they cannot changed, but the changes have to made through ATLAS.ti in order for the program to “know” about them and to adjust its references accordingly. For this purpose—to guarantee absolute document integrity—we introduced the user and team libraries in ATLAS.ti 7. These specially protected internal folders that serve as repositories for your data files. Now, some users have thought it a good idea to move their repositories to a cloud-based system like Dropbox. The thinking is that it would be great to have access to the file from another location or to give access to this same file to other users (in a team, for example). Unfortunately, there is a major flaw with this concept. Users overlook the fact that Dropbox will simply replace the existing file with another copy of the same file if a user—either the original author or another user with access to the file—makes changes to this file. From the point of the document alone this makes sense, but from the point of view of an application that requires the document to remain intact this is catastrophic since Dropbox does not “inform” the application (or the user) of the changes. The required file integrity has been undermined without the user being even aware of it. To put it differently, it is the very nature of Dropbox and other cloud-based services that they will simply go ahead and change data in your repository without asking if and when this data has been changed elsewhere--with or without the user's knowledge or consent. Therefore, ATLAS.ti strongly advises users against moving the library to Dropbox (or other cloud-synced services/folders). Loss of data or other unpleasantries are likely to result if multiple users work simultaneously with a repository that resides in Dropbox. ATLAS.ti is started on computer A on Jan. 1, on computer B on Jan. 6, and is kept running on both computers. ATLAS.ti will not "know" about the files that have been "secretly" changed by the cloud service in your repository in this case and will be unaware of the changes in your documents. This will result in misaligned quotes, unconnected codes, and overall unusable PDs. We would like to make it very clear that the above is NOT a bug or design flaw of ATLAS.ti in any way. Rather, such problems are the natural consequence of the way in which cloud services work and the user's choice of making use of such a service. You will understand that ATLAS.ti GmbH will therefore also not be able to accept any responsibility and no liability for any data loss caused by moving your libraries to a cloud-based service. Having said that, we are aware that users have the desire to combine the use of the repositories with cloud services and our development team is working on a solution that will allow a productive use of such services in the way users intend. However, while a workaround will be feasible in the relatively near future, a fully developed cloud-based repository will not be available any time too soon. Developing a mechanism for ATLAS.ti to recognize and fix data conflicts resulting from such covert change is something that can and will be undertaken by our development team but it is definitely a new program feature, not a simple bug fix, and will take longer accordingly. The ATLAS.ti Training Center has been very busy lately. In this section, we will tell you something about our current activities and what awaits us in the future. We have created a set of courses that introduce novice users to ATLAS.ti and that allow experienced users to explore new tools and applications. Presently, we offer weekly free demo webinars providing an overview of ATLAS.ti; introductory and advanced online webinars taught at times convenient to users in different timezones; short special topics courses focusing on specific applications; and courses in different cities in the United States and Brazil. In the near future, we will offer face-to-face courses in Europe as well. As a way of supporting graduate students, we are launching the Student Training Scholarship. Through this program, we will be awarding 10 scholarships (full and partial), per semester, for our introductory online and face-to-face workshops. To qualify, applicants need to be doctoral students with their dissertation proposals already approved. Applications must be submitted in English or Spanish. We are accepting applications now for courses taught between January and June 2013. For more information, please contact us at [email protected] . A complete list of courses and free demo webinars taught by the Premium Training program can be found at training.atlasti.com . In addition to the Premium Training courses, we have recently begun the “Certified ATLAS.ti Trainer” program, through which we certify independent consultants who are experienced ATLAS.ti trainers. Certified trainers receive on-going technical support from us and are given the opportunity to advertise their courses through our website, newsletter, and other various means. Some of the courses that will be taught by the current certified trainers in the coming months are listed below. For more information on these workshops and a detailed list of all trainings offered by independent consultants, our website at http://www.atlasti.com/workshops.html . If you are interested in applying for the trainer certification, please send us an email at [email protected] . We are very proud of the partnerships we are establishing with renowned academic institutions. In collaboration with the International Institute for Qualitative Methodology (IIQM) at the University of Alberta, we have created two programs aimed at supporting students and researchers. First, the “ATLAS.ti-IIQM Dissertation Award”, which provides one award a year to graduate students employing qualitative methods in their research. The award consists of US$3,000.00 in cash, plus complimentary registration for the two conferences on qualitative research organized annually by IIQM, and a free ATLAS.ti license and training. Utilizing ATLAS.ti in data analysis does not constitute a requisite to qualify for this award. For more information on this opportunity, please visit the IIQM website at http://www.iiqm.ualberta.ca/en/DissertationAward.aspx . The second program in partnership with IIQM is a webinar series on qualitative methodology titled “The Qualitative Methods Master Class Webinar”. The webinar series consists of monthly lectures by qualitative researchers presenting models and lessons learned that can be useful to researchers across disciplines. Some of the topics covered in this series include narrative inquiry, interpretive writing, hermeneutics, ethnographic inquiry, and video analysis. A complete list of presenters and topics will be available soon on the ATLAS.ti website as well as at http://www.iiqm.ualberta.ca/en/ResearchTraining/WebinarSeries.aspx . To join a webinar, you just need to have a fast Internet connection and a headset. Necessity for New Methods in Computer-Assisted Qualitative Data Analysis. Instructor: Susanne Friese. Joined Up Thinking: Using ATLAS.ti with Google Earth to Analyse ‘Place’. Instructor: Christina Silver. Qualitative Video Analysis: Various Approaches and New Possibilities. Instructor: Susanne Friese. More information will be available soon on the websites of ATLAS.ti and the CAQDAS Networking Project, as well as through social media. You may also send us an email at [email protected] . The future looks bright. We will continue expanding the learning opportunities for novice and experienced ATLAS.ti users as well as supporting the development of the qualitative methodology field worldwide through innovative partnerships with academic institutions. We invite you to be part of this project!